Plantworx is the UK’s largest working construction equipment exhibition. The latest show, organised by the Construction Equipment Association, was staged in June at the Bruntingthorpe Proving Ground, Leicestershire. Roger Murrow reports. 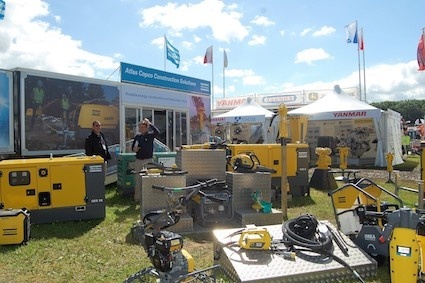 Despite the combination of torrential rain, mud and blistering heat, over 17,000 visitors attended and saw 386 exhibitors display and demonstrate their latest equipment. Plantworx Innovation Award winners were also announced, including The People’s Choice Award, where visitors voted for their favourite product, machine or service. The winning products were presented in video format. Although Plantworx is a general construction equipment exhibition, many manufacturers and distributors of demolition equipment launched new products and services. These included breakers, crushers, screens diamond drilling and much more. Plantworx can also now be considered an important date in the UK, and pan-European demolition calendar. Buckets and attachments were on display from many of the manufacturers, including Remu, MB and Allu. Arden Equipment launched its Arden jet system and showed its range of demolition and recycling attachments that included clamshells, multi-tine scrap grabs, sorting grabs, scrap shears, pulveriser breakers and multi processors. BPH Attachments launched a new range of demolition shears for excavators in the 3t to 280t class. The Prodem PDS series has an upper jaw protection system that reduces maintenance and build up on the upper jaw. Dromone, the Irish manufacturer, exhibited Pick-Up hitch and excavator quick coupler technology. ECY Haulmark concentrated on its demolition and recycling attachments from VTN Europe. The company also displayed the LaBounty range of MSD scrap shears and pulverisers. A working demonstration featured a Kiesel KLS400 T.A.B. fitted with the OilQuick automatic quick coupler system. Hill Engineering displayed its new Tefra Tilt Hitch, the award winning Tefra Coupler, Hill Titan buckets and the Hill Titan Thumb. The Hill Titan Thumb adds versatility to an excavator and is suitable for a variety of material handling applications. Kinshofer exhibited a range of attachments for loader cranes and hydraulic excavators encompassing the Auger Torque, Demarec and RF brands. Italy was represented with Cangini Benne displaying and demonstrating its attachment tools for host machines weighing from 0.6t to 14t. SOCOMEC, along with its UK distributor Bossi Plant Sales, also exhibited and demonstrated many of its hydraulic breaker and ripper attachments for excavators. Simex likewise showed its earthmoving attachments for compaction, crushing, milling, and tunnelling. The company also demonstrated its new range of screening buckets. 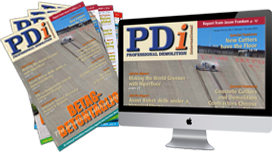 Pladdet UK highlighted the attributes of its sorting demolition grab along with hydraulic scrap/metal shears, rotating and fixed hydraulic pulverisers, ripper teeth, hydraulic breakers and compactor plates. There were many breaker manufacturers represented at Plantworx, including Arrowhead Rockdrill, which launched its new R range of hydraulic hammers. These are based on a patented design that eliminates the need for tie rods in the hammer assembly and simplifies construction. Atlas Copco’s showed its new RTEX handheld pneumatic breaker range. This is claimed to offer huge savings as it reduces energy consumption by 50% whilst achieving high breaking efficiency. The breaker has been shortlisted for the Executive Hire Show's Innovation Trail. BPH also exhibited a range of its breakers. Brokk introduced to the UK its new Brokk 500 demolition robot, which features the Brokk SmartPower electrical system, a more powerful breaker with extended reach. “The Brokk 500 is a remarkable demonstration of how far we have come in getting the most demolition power possible out of a Brokk machine without adding to its size, largely thanks to our new Brokk SmartPower system,” said Brokk Group chief executive Martin Krupicka. ECY Haulmark exhibited a range of Furukawa hydraulic breakers. This included the latest in the FX range of small breakers through to the FXJ range for heavy demolition and quarrying applications. Husqvarna Construction Products showed its DXR demolition robots, and a dust reduction system used with Atlas Copco breakers and Brokk robots. New mini crushers and screens, ideal of demolition in inner city sites, were on display. Powerscreen Ireland was represented under its TrommALL brand, with a sorting screen on show. Herbst and Seba had impressive stands, with extensive ranges of crushing and screening equipment on display. ECY Haulmark’s focus on crushing was provided by the Rubblemaster RM70Go! 2.0 compact tracked impact crusher, with the model on display having been bought by Tyne Tees Demolition. Perhaps the largest range was exhibited by Red Rhino Crushers, who were also the Environment Award winners at the Plantworx 2017 Awards for Innovation. The company now manufactures mini crushers and screens ranging in size from 500kg to 10t. Launched at Plantworx was its new three-way split screen, which provides a compact solution for material processing. Atlas Copco launched its 8 Series of 10 portable air compressors, which can be towed behind a car without a special license. Reliability, efficiency and higher utilization levels, coupled with superior performance, maximize the return on investment the range offers to both rental and construction partners. There were18 new additions added to Atlas Copco’s open frame diesel-driven centrifugal dewatering pump range. The pumps focus on high fuel efficiency and cover a wide spectrum of sizes. Dynaset concentrated on its hydraulic generators, power washers and compressors. The hydraulic equipment has been designed to convert the mobile machine's hydraulic power into electricity, high-pressure water, compressed air, magnet and vibration. CEJN UK manufactures ultra-high-pressure hose assemblies with exhibited equipment covering 700bar to 3,000bar. Doosan, JCB, Komatsu and many other manufacturers were all represented with equipment for a variety of applications. Avant Techno UK showcased its battery-powered, zero emission loader. This new e-series is in the same size class as the Avant 500 series, offering zero emissions, extremely low noise and minimal running costs. “The new e-series are truly green machines, enabling up to an hour of heavy duty application, which is extremely useful in demolition and construction when CO2 emissions are a problem,” said Avant UK managing director Raimo Ala-Korpi. Volvo Construction Equipment concentrated on its range of utility equipment including the EC15D, EC18D, ECR25D, ECR50D, ECR35D, EW60E, ECR88D compact excavators, DD25B roller plus the 14t excavator EC140E and an FH16 from Volvo Trucks. The new Volvo EC27D was shown for the first time in Europe whilst on the demonstration area the ECR25D and EW60E were put through their paces. Wacker Neuson showcased its WL20e electric wheel loader, which was highly commended in the Environmental Innovation category of the Plantworx Innovation Awards 2017. Also on display was ET90 tracked excavator. Husqvarna Construction Products demonstrated its high frequency PRIME equipment and wall saws, large floor saws, as well as launching a new wall saw chain attachment, which converts its wall saw to a chain saw. Tyrolit displayed and demonstrated its new range of hydraulic and Hi Frequency wall saws and wire saws together with floor saws and drilling equipment. Diaquip focused on its in diamond drilling and cutting equipment, with a portfolio of products manufactured in the UK. Graphex Introduced its grapheX diamond technology, utilizing wide particle size distribution of high grade De Beers synthetic diamond with the largest diamond grit sizes to be used in Europe. Hilti exhibited and demonstrated its DST 10-CA Wall saw for cutting reinforced concrete. Its compact design and trolley allows it to be transported and set up quickly by just one person. Also demonstrated was the DD-WMS 100 water management system. Pentruder UK has added a diamond tool division and used the exhibition to show how its range of equipment has been designed to operators’ jobs easier, safer and more efficient. The Drill and Saw Association was present to represent and support companies involved in the drilling and sawing industry. DSA members benefit from approved operator training courses and the adoption of national safety standards and working codes of practice, as well as affiliation with other recognised construction industry international and national associations. The DSA also provides a forum for members to meet within an organised framework to discuss and share best practice and the future development of the industry. Other equipment and services, which stood out, included Multiquip (UK) with its comprehensive product range. This includes the Whiteman power trowels, Mikasa compaction plates and compaction rammers and concrete flatwork tools. The Whiteman ride on power trowels and its latest range of water pumps were demonstrated. Concrete Services and Supplies, a specialist concrete product and services company, featured its own Contop topping spreader as well as concrete power buggies, pans, blades, concrete tools and other concrete flooring accessories. Plantworx has grown as an exhibition in its short life. Given the manufacturers represented, and the visitor profile, the show fills a niche, which allows companies of all sizes to display their products and services. Many of these companies are often not able to exhibit at larger shows, due to cost. Plantworx however presents construction, demolition and civil engineering companies with the opportunity to see at first hand equipment and services ideal for their requirements.